The celebratory poem of Georgette Debladis, C'est la paix, could not mask the horror of the war for Fauré or his acute awareness that far too many did not return from the fray. One of these, a cross-channel brother-in-art to Rupert Brooke and Wilfred Owen (though far less famous) was Jean de la Ville de Mirmont (1886–1914). As a frontispiece to the second edition of Jean de la Ville’s poems (1947) François Mauriac draws a touching pen-portrait of a talented fellow-student from Bordeaux – a tall, good-looking young man of the greatest sensibility. Born in a busy port, his poetry is full of dreams and fantasies concerning travel: Baudelaire-like journeys never undertaken, visits to continents as yet undiscovered and from which no vessel has ever returned. The poet died bravely in the first year of the war, leaving only a few works – Lettres de guerre sent to his parents from the front, and a slim recueil of poems. This was published in 1920 with engravings by Léon Dusouchet (one of which is reproduced here). The title of the first group of fourteen poems (from a total of forty-one) gave its name to the entire collection – L’horizon chimérique – and to Fauré’s cycle. The poems the composer chose for setting are numbered 13, 14, 11 and 5 in the poet’s sequence. Fauré might have refused to write a work celebrating the allied victory, but one feels that he wished to honour a talent from the ranks of the fallen. Very untypically he did not alter a word of the poet’s texts (although he did excise one strophe). The work was given its first performance by its dedicatee, the talented young baritone Charles Panzéra (destined to become one of the most famous of French singers) in May 1922, accompanied by his wife, Magdeleine Panzéra-Baillot. Pour Fauré, le poème commémoratif de Georgette Debladis, C'est la paix, ne pouvait masquer ni l’horreur de la guerre, ni le fait que bien trop n’en étaient pas revenus – un fait dont il avait une conscience aiguë. Frère d’art, de l’autre côté de la Manche, de Rupert Brooke et de Wilfred Owen, mais bien moins connu, Jean de la Ville de Mirmont (1886–1914) fut de ceux-là qui ne revinrent pas. En frontispice à la seconde édition de ses poèmes (1947), François Mauriac brosse un touchant portrait de ce talentueux condisciple bordelais – un beau et grand jeune homme, doué de la plus extrême sensibilité. Né dans un port animé, il écrivit une poésie gorgée de rêves et de fantaisies liés au voyage: périples baudelairiens jamais entrepris, visites de continents encore inconnus et d’où nul vaisseau n’est jamais revenu. Mort bravement dans la première année du conflit, il ne laissa que quelques œuvres – des Lettres de guerre envoyées du front à ses parents et un mince recueil de poèmes publié en 1920 avec des gravures de Léon Dusouchet. Le titre du premier ensemble de quatorze poèmes (sur un total de quarante et un) a donné son nom au recueil – L’horizon chimérique – et au cycle de Fauré, lequel choisit de mettre en musique les poèmes nos 13, 14, 11 et 5. Fauré avait beau avoir refusé d’écrire une œuvre célébrant la victoire alliée, on n’en sent pas moins qu’il souhaitait honorer un talent issu des rangs de ceux qui étaient tombés au champ d’honneur. Chose exceptionnelle, il ne change pas un mot des textes (même s’il en retranche une strophe). L’œuvre fut créée en mai 1922 par son dédicataire, le talentueux jeune baryton Charles Panzéra (appelé à devenir l’un des plus célèbres chanteurs français), accompagné par sa femme, Magdeleine Panzéra-Baillot. Aux vaisseaux que mon cœur dans leur fuite a suivis. Les goëlands perdus les prendront pour des leurs. The sea is boundless and my dreams are wild. To dance on the sea like drunken birds. Whose flight my heart has followed. Lost gulls will take them for their own. In his very last creative phase Fauré rediscovers a new energy for his music (not only for the songs, but in the second Cello Sonata and the thirteenth Nocturne for piano). He emerges here from the veiled mysticism of Mirages and places his hand firmly on the tiller of life. This return to the positive, even joyful, aspects of music-making is partly encouraged by these fine poems of the sea, Fauré’s beloved medium of water: transparent and opaque, restless and peaceful, never the same from one moment to the other. (In the same way this composer’s music changes harmony imperceptibly from one chord to the next.) 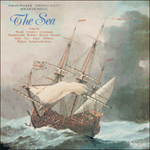 The moto perpetuo semiquaver accompaniment of this song is a good example of this ‘sea-change’ – undramatic yet teemingly eventful, and demanding enough to sink even the best sight-reader. The infinite vistas of the horizon are mirrored by the implacable rise of the vocal line through an entire octave. 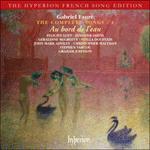 In Accompagnement and Mirages we have encountered the eerie stillness of lakes; here we rediscover a composer not shy of suggesting the buffeting of real waves at climactic points (as at ‘Ivres d’air et de sel’); the composer, at home in this amalgam of reverie-fantasy and vigorous determination, revels in his starring role in ‘The Old Man and the Sea’, avant Hemingway. The inspiration of Panzéra’s voice (broader and richer than any typical salon singer) must have played its part in encouraging the composer to paint with a broader brush dipped in testosterone. The result remains utterly Fauréan, but the music itself seems less self-conscious, more accessible, than many of the third-period songs. Dans sa dernière phase créative, Fauré se découvre une nouvelle énergie musicale (les mélodies, mais aussi la Sonate pour violoncelle no2 et le treizième Nocturne pour piano). Il abandonne ici le mysticisme voilé de Mirages et pose une main ferme sur la barre de la vie. Ce retour aux aspects positifs, voire joyeux, de la création musicale est en partie encouragé par ces beaux poémes sur la mer, l’univers de l’eau si cher à Fauré: transparente et opaque, agitée et paisible, jamais la même d’un instant à l’autre (pareille en cela à la musique fauréenne, qui change imperceptiblement d’harmonie d’un accord à l’autre). L’accompagnement en doubles croches du moto perpetuo illustre bien cette mer changeante – peu spectaculaire mais débordant d’agitation, il est assez exigeant pour faire sombrer même le meilleur des lecteurs à vue. Les panoramas infinis de l’horizon se reflètent dans l’implacable ascension de la ligne vocale sur toute une octave. Accompagnement et Mirages nous ont entraînés vers l’inquiétante quiétude des lacs; ici, nous redécouvrons un compositeur qui ne craint pas de suggérer les assauts des vraies vagues, en des endroits paroxystiques (comme à «Ivres d’air et de sel»); Fauré, chez lui dans cet amalgame de rêverie-fantaisie et de farouche détermination, se délecte à jouer la vedette dans «Le vieil homme et la mer», avant Hemingway. L’inspiration insufflée par la voix de Panzéra (plus ample et plus riche que celle de tout autre chanteur de salon) a dû inciter le compositeur à peindre avec un pinceau plus large, trempré dans la testostérone. Le résultat demeure complètement fauréen, même si la musique paraît moins timide, plus accessible que dans bien des mélodies de la troisième manière. À vivre parmi vous, hélas! avais-je une âme? And rolls and pitches and rocks. Lovelier than the tired ones of human song. Ah! did I have the heart to live among you? Brothers, on all your continents I’ve suffered. To cradle me like a child in the trough of the waves. Tears of parting no longer sting my eyes. O my sorrow, my sorrow, where have I left you? In this farewell to his beloved key of D flat major, Fauré matches and illumines the obsessive wanderlust of the poet. The accompaniment almost overuses the insistent dotted quaver + semiquaver figuration that launches the music and propels it forward (except in the remarkable cradling music at the end of the second verse, a welcome respite, and one of the composer’s most inspired use of hemiola – the ear is led to hear six bars of 2/4 instead of the four bars of 3/4 that appear on the page). 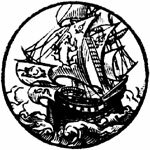 Although Ville de Mirmont has a large sailing ship in mind the composer harks back to his Chanson du pêcheur, Barcarolle and Accompagnement by creating a bass-clef motif that suggests an oar plying its way through water. This is the oar of the imagination cleaving through the constraints that keep the poet grounded on dry land and it gives the song terrific thrust and momentum. Fauré chooses to end on a most untypical note of pathos (‘Ô ma peine, ma peine’), something that a larger-than-life singer like Panzéra could carry off with conviction because of that ‘extra physical dimension that organizes, surpasses and overturns the whole cultural part of music’ (Roland Barthes, writing of this artist’s powers). This is another way of saying that singers with the finest voices and visceral instincts can break the rules, shocking by the tastes of the over-refined salon, but communicating on a wider level. Ville de Mirmont provides a last strophe, cut by the composer, which announces the poet’s departure for a destination beyond the Antilles. He asks whether his heart (which is the only cargo he will take with him) will appeal to the savages as a cheap trinket. It is a line that might have raised a rueful smile – not suitable for the atmosphere bordering on melodrama created here for a singer like Panzéra. Dans cet adieu à sa chère tonalité de ré bémol majeur, Fauré égale et illumine l’obsessionnelle Wanderlust du poète. L’accompagnement abuse presque de l’insistante figuration croche pointée + double croche qui propulse la musique vers l’avant (hormis en fin de deuxième strophe, où une remarquable musique berçante offre un répit bienvenu et constitue l’un des usages de l’hémiole les plus inspirés du compositeur – l’oreille est amenée à entendre six mesures à 2/4 au lieu des quatre mesures à 3/4 inscrites sur la page). Ville de Mirmont a en tête un grand voilier, mais Fauré revient à la Chanson du pêcheur, à la Barcarolle et à Accompagnement en créant un motif en clef de fa quatrième ligne, évocateur d’une rame maniée vigoureusement dans l’eau. C’est la rame de l’imagination fendant les contraintes qui maintiennent le poète arrimé à la terre ferme – d’où un dynamisme et un élan terribles conférés à la mélodie. Fauré choisit de conclure sur une note de pathos des plus atypiques («Ô ma peine, ma peine»), un pathos qu’une nature aussi généreuse que Panzéra pouvait véhiculer avec conviction grâce à «cette dimension physique supplémentaire qui organise, surpasse et renverse toute la part culturelle de la musique» (Roland Barthes, à propos des moyens de cet artiste). Autrement dit, les chanteurs dotés des plus belles voix, doués d’instincts viscéraux peuvent casser les règles, ce qui, pour choquer les goûts des salons par trop raffinés, s’avère porteur à un plus large niveau. Dans une dernière strophe, supprimée par Fauré, Ville de Mirmont annonce son départ pour une destination par-delà les Antilles. Il se demande si son cœur – l’unique cargaison dont il se chargera – attirera les sauvages comme un bijou de pacotille. Ce vers aurait pu prêter à un sourire complaisant, inapproprié à l’atmosphère proche du mélodrame façonnée pour un Panzéra. The regret of a sun whose loss we lament. Longs for the peace of your nocturnal flame. This hymn to the goddess Diana is the last in a line of evocations of antiquity threading its way from Lydia to Pénélope; in the chords of the infinite calm of the song’s opening we can also detect an echo of the noble beginning of Duparc’s Phydilé. This is also Fauré’s last vocal nocturne, simpler and more direct than many of the others. The accompaniment consists of deceptively laconic crotchet chords which glide without haste, implacably determined nevertheless. This circular progress from the opening to the closing E flat chords seems a journey charted in the stars (one thinks of another sailor’s hymn to sidereal beauty, Schubert’s Lied eines Schiffers an die Dioskuren). For his vocal line Fauré has somehow conjured a memorable tune out of the unremarkable inflections of speech. In this vast calm of this picture the tiniest details seem significant, such as the clash, the glint of ‘beau métal’, between B flat and A natural in the pianist’s hands. This is one of many such touches: the drop of fourth on ‘perte’ (of no account in most songs, here utterly bereft); an address to the moon (‘Ô lune, je t’en veux de ta limpidité’), where the baritone voices his plea in a higher and lighter tessitura. As the accompaniment’s single pair of quavers stirs in a sea of crotchets, ‘agité’ is contrasted with ‘paix’ (the harmonization of which unfurls like a white flag and prepares the way for the truce of the closing cadence). It is little wonder that this poem was so fitted to Fauré’s purpose: the words ‘mon cœur, toujours las et toujours agité’ express a central paradox in the composer’s life and career. Cette hymne à la déesse Diane est le dernier maillon d’une chaîne d’évocations de l’Antiquité qui s’insinue de Lydia à Pénélope; les accords de l’infini calme de l’ouverture recèlent aussi un écho du noble début de Phydilé de Duparc. Cette pièce, par ailleurs ultime nocturne vocal de Fauré, est plus simple et plus directe que nombre de ses pendants. L’accompagnement consiste en accords de noires faussement laconiques qui glissent sans hâte, mais avec une détermination implacable. Cette progression circulaire, de l’ouverture aux accords conclusifs en mi bémol, semble un voyage tracé parmi les étoiles (ce qui n’est pas sans rappeler l’hymne à la beauté sidérale d’un autre marin, le Lied eines Schiffers an die Dioskuren de Schubert). Pour sa ligne vocale, Fauré est parvenu à faire surgir un air mémorable des banales inflexions du discours. Dans la vaste quiétude de ce tableau, les plus infimes détails paraissent importants – ainsi la friction, le miroitement du «beau métal» entre si bémol et la bécarre sous les doigts du pianiste. Ce n’est là qu’une touche parmi d’autres: la chute de quarte sur le mot «perte» (quelconque dans la plupart des mélodies, mais profondément affligé ici) et une parole adressée à la lune («Ô lune, je t’en veux de ta limpidité»), où le baryton formule son appel dans une tessiture plus aiguë et plus légère. Alors que l’unique paire de croches de l’accompagnement se débat dans une mer de noires, «agité» est mis en contraste avec «paix» (dont l’harmonisation déferle tel un drapeau blanc, préparant la voie à la trève de la cadence conclusive). Guère étonnant que ce poète ait été en si parfaite osmose avec le dessein de Fauré: ses mots «mon cœur, toujours las et toujours agité» n’incarnent-ils pas un paradoxe au sein de la vie et de la carrière du compositeur? Au delà du rivage où s’arrêtent nos pas. The last of you all has set sail on the sea. That this port and my heart are forever forsaken. Beyond the shores where our steps must halt. You require distant realms unknown to me. I belong to those with earthbound desires. For within me are vast, unappeased departures.